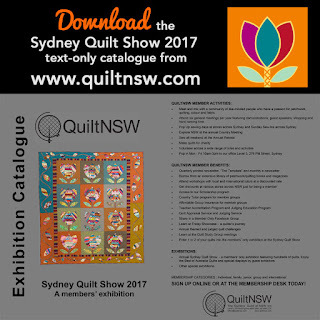 The Sydney Quilt Show 2017 opens on Thursday 22 June at the International Convention Centre Sydney at Darling Harbour from 22-25 June 2017. Opening hour are 9am-4.30pm. The awards ceremony is at 1pm on Thursday. Download Transport & Ticket Information Flyer. A short-form catalogue will be available at the show. This printed catalogue includes sponsor information; title, size and category information for each quilt entry and a layout diagram, A longer version of the catalogue that includes quilt descriptions and other information is now available.